Readers of this blog should already be familiar with Ötzi the Iceman (his face) (his tattoos). This is what his axe looked like. Ötzi's copper axe was of particular interest. 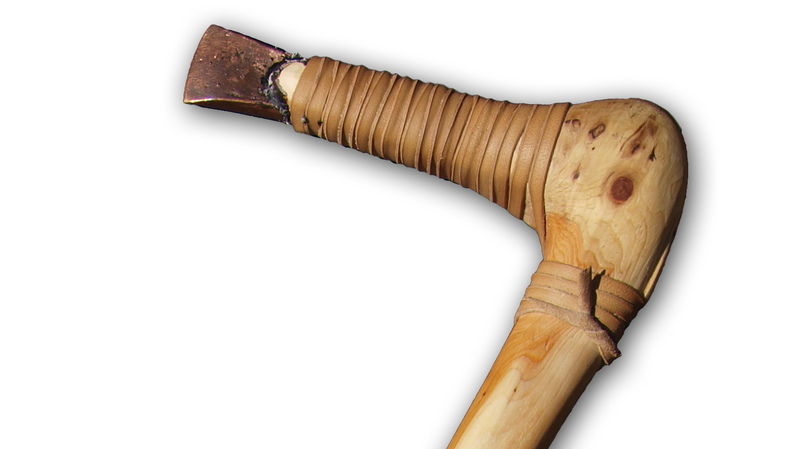 The axe's haft is 60 centimetres (24 in) long and made from carefully worked yew with a right-angled crook at the shoulder, leading to the blade. The 9.5 centimetres (3.7 in) long axe head is made of almost pure copper, produced by a combination of casting, cold forging, polishing, and sharpening. It was let into the forked end of the crook and fixed there using birch-tar and tight leather lashing. The blade part of the head extends out of the lashing and shows clear signs of having been used to chop and cut. At the time, such an axe would have been a valuable possession, important both as a tool and as a status symbol for the bearer. 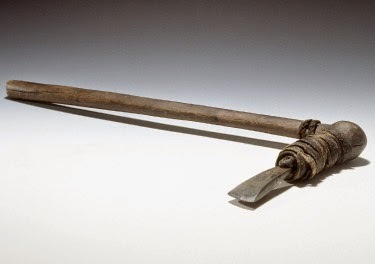 - from the Otzi website, where there are many more details about this tool. In Central Europe in the period around 3000 BC, a copper axe would have belonged to a man of high social status. This is confirmed by grave finds from this period. In the grave field at Remedello di Sotto southwest of Lake Garda, for example, only 17% of the axes placed in the men’s graves had a copper blade. The copper axe blades recovered from those graves are identical in shape and size to the Iceman’s. If you would like to make one, someone else has posted a photo gallery of the steps required to craft the tool. Presumably a deadly weapon as well as useful for chopping the thinner trunks of trees that grow in a very cold climate? Look at the extreme narrowness of the blade. This makes the item shown very inefficient for even the thinnest saplings or branches. In that period, prehistoric peoples had developed blades with wider surface areas for those purposes -- things like wide-bladed axes, sickles and machetes. (I'm presuming the same would apply to Otzi's people.) What you need for chopping wood (and other things, like human limbs) is a wide surface area, not a very narrow head; that axe which would have penetrated into wood and likely broken off instead of shopping. The items people of that period used were sophisticated, expertly designed for the purposes to which they were put. In short, they almost certainly wouldn't have used such an awkward design for agricultural or wood harvesting purposes. It's simply not a mechanically efficient design for that.